These muffins are a perennial favorite in my family. We always bring a double batch to our Thanksgiving weekend at the beach, and with all the great food there, they are the first snack to be GONE. We’re talking moist and flavorful, cake-like muffins. One is never enough. They were equally popular in the days when I hosted a high school advising group for breakfast. It’s a good thing for sure when you discover a food packed with nutrition that teen-agers clamor over. This morning’s batch is dedicated to a young man who is now at Holy Cross – he liked these pumpkin muffins so much his mom requested the recipe. So easy to make, and you probably have all the ingredients on hand except the pumpkin. Pick up an extra can next time you’re at the grocery store. Make a batch and freeze the muffins when they have cooled to room temperature. 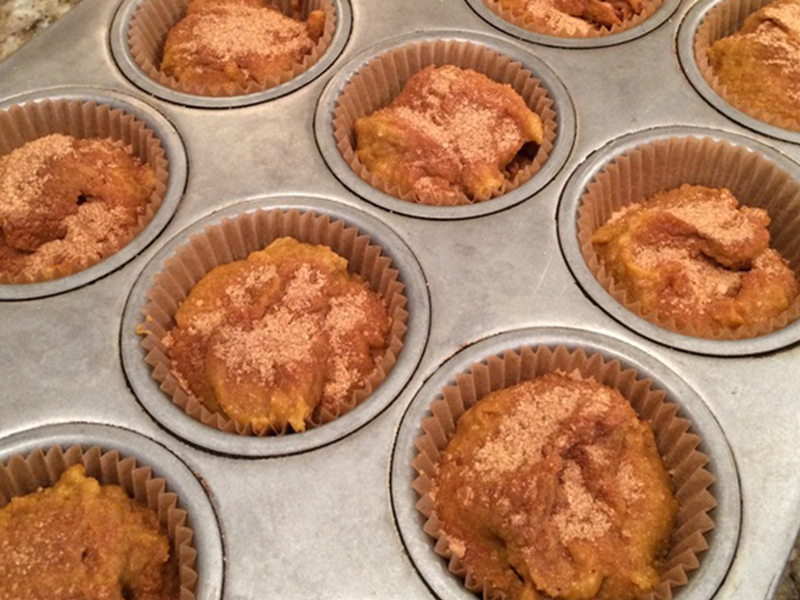 You’ll have fresh-baked pumpkin goodness on hand whenever you’d like a little something sweet! Preheat the oven to 350 degrees, and put liners in muffin cups. Whisk together the flour and baking powder in a small bowl. 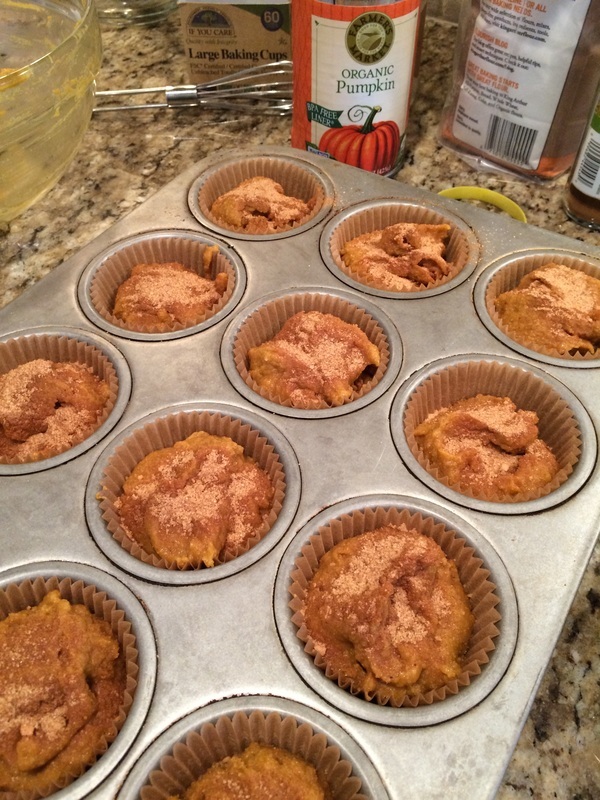 In a large bowl, whisk together pumpkin, oil, eggs, cinnamon, nutmeg, sugars, baking soda, and salt. Beat until smooth and then whisk in the flour mixture until just combined. Stir together the additional cinnamon and sugar for the topping. Divide the batter among muffin cups (each should be about three-fourths full), and then sprinkle tops with cinnamon-sugar mixture. Bake until puffed and golden brown and a tester inserted into the center of a muffin comes out clean, about 20 minutes. Cool in the pan on a rack for 5 minutes, and then transfer the muffins from pan to rack and cool to room temperature.